Click a link to jump ahead to that section. Area past the Blue Whale Skeleton in front of the iron gates will be replaced with beautiful pavers and bollards delineating the car free area. Pathway from Mission Canyon Road along front of Museum to entrance will be restored to its original design including plantings and small boulders. Along the north side of the hall, this new diorama will showcase animals seen around the Museum campus including a Striped Skunk, Raccoon, and Bats. Diorama describing the role of apex predators. This existing diorama will be cleaned, repainted, rockwork repaired, fresh plants added, and lighting replaced. A touchable model of a Mountain Lion tongue will be added. Diorama describing adapting to changing landscape. This existing diorama will be cleaned, repainted, plant and tree foliage added, and lighting replaced. A touchable model of a Mule Deer leg and other touchable artifacts will be added. Diorama describing how the Pronghorn were almost extinct. This existing diorama will be cleaned, new ground form and plan added. A Blacktailed Jackrabbit will be added. A touchable display of horns versus antlers will also be added. Diorama explaining the role of Tule Elk in maintaining grasslands. This existing diorama will be cleaned with new grasses and plants added. The Elk will be cleaned, airbrushed, and repaired to its original luster. New open air “diorama” explaining the ecology and role of the human mammal in the modern world, as well as our relationship with nature. Allows visitor to become “part of the diorama”. The human mammal’s role in managing wildlife and nature will be addressed. This existing diorama will be cleaned, new lighting added, and the taxidermy repaired. A touchable Sea Lion skull will be added. Diorama describing the extinction of the California Grizzly Bear. This existing diorama will be cleaned, and the lighting replaced. A touchable model of a Grizzly Bear and Black Bear paws and claws will be added. Diorama explaining the potential to bring back wolves to California. This existing diorama will be cleaned, repainted, and ground form added. Wolves will be repositioned. This diorama was never finished, and we will address this by adding a focal point for the wolves to be gazing at. Diorama describing why Bighorn sheep are so rare and hard to find. This existing diorama will be cleaned, repainted, and ground form added. Comparative hoof models of a deer foot and a Bighorn will be added. Black Bears filled the niche left by the demise of California Grizzlies, and were introduced here intentionally. This exhibit will be cleaned, new plant materials added, a grey squirrel and new plant matter will be added along with new lighting. A touchable bear skull and possibly a pelt will be added. The Pacific Harbor Seal diorama will be cleaned, new lighting installed, new beach materials, kelp and small marine life added. A Touchable flipper skeleton model and Harbor Seal skull model are planned to be added. Badgers are important grassland predators. This exhibit will be cleaned, new ground form added, and new background mural painted. This display will be relocated near the Bobcat to compare behavior. This new exhibit will help explain what Bobcats and badgers have in common. A new taxidermy coyote will be created for this renovated space. The female will be bringing prey back to a den (below) for the open air, touchable pup models, reaching up to greet her. Ringtails are nocturnal animals. This small diorama will be cleaned and a new mural painted. Lighting is intended to portray an early evening scene. Cottontail rabbits are great survivalists. This small diorama will be cleaned and ground form will be reworked. The Spotted Skunk diorama will be cleaned and new leaf litter added. The mural will be changed and taxidermy repaired. Weasels are amazingly fierce. This small diorama will be cleaned, mural repainted, and new grasses added. New small prey and blood stains will be added along with stories of how they take prey twice their size. Hint: Dancing is involved. A display of CLAWS from a Coyote, Cougar, Wolf, Fox, Bobcat, Badger, Grizzly Bear, Black Bear, and Raccoon that are touchable. A touchable display of a Mule deer pelt and Harbor seal pelt. Touchable display of compelling natural items. Our volunteer docents will use this new Mammal Hall activity cart to interact with school children and visitors. The cart will house pelts, claws, and other mammal related items. The cart will represent a significant improvement for docents and visitors, allowing for higher quality interactions throughout the gallery. Staff select ten favorite locations to explore in the region. This refresh of the butterfly emergence case and Monarch diorama area will demonstrate the dynamic nature of our diverse region through the cycle of a year. Butterflies are a year round focus for the Museum and this diorama will fill the need for changing interpretation over the year. 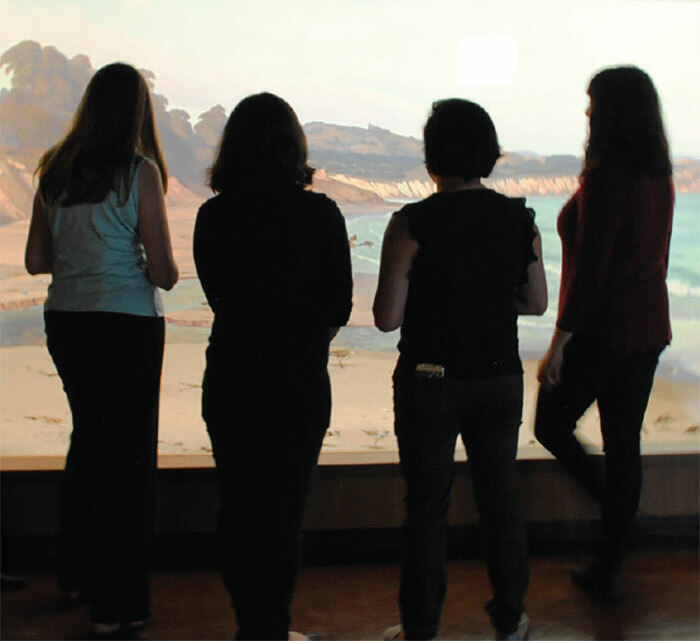 Exhibits in the center room in the Gallery will focus on how we affect nature and how it affects us. Exhibit about how current population levels and impacts of human activity are exceeding the carrying capacity of our natural environment and how we can manage resources to ensure long term survival of the planets populations. Digital display of real time ecological challenges and successes. Exhibit panels explaining global warming and how sea levels are rising. Two exhibit panels and the current free standing fire diorama will be recreated and moved into a now vacant diorama nearby. New interpretation will convey the realities of fire in California’s ecology as well as the impact of extreme weather on flooding. Exhibits and dioramas in the most eastern room in the Gallery will focus on the diverse species and habitats within the area, how and where you can find them, and what to look for when you go explore. This table is located in the center of the room and includes the Diorama Explorer application. 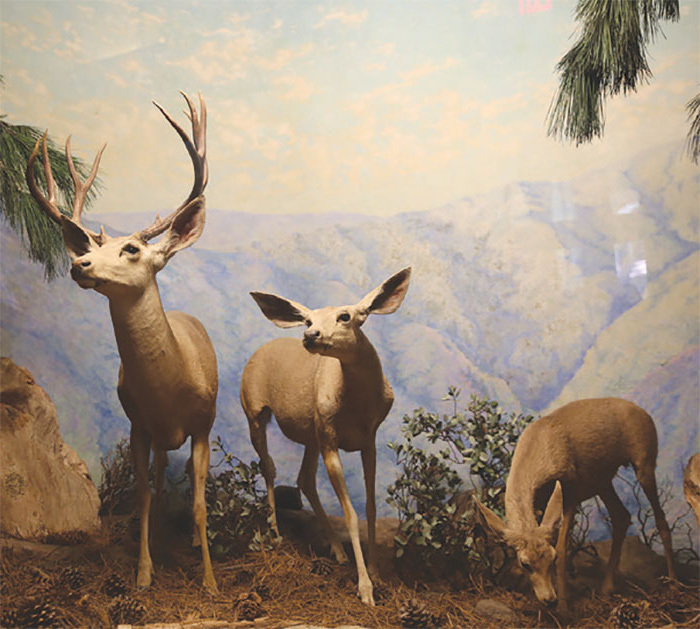 Largest diorama in the Gallery will be cleaned, and mammal a suite of new taxidermy specimens representing a connected web of life will be added to show how habitats support species and species interact in our region. Much more than bees. A small diorama that features Santa Barbara’s pollinators, from bugs to bees and wasps, to butterflies and beyond. We rely on pollinators, and it would be wise to protect them. A refresh to Oak Woodland diorama includes a new water surface, ground form work, taxidermy repair and replacement. The exhibit explains the role of oaks in providing a home to a diverse community of species. There will also be new and very visible animal stories here including the “burying beetle” which buries a dead mouse and creates a home beneath it as it uses the animal as its own food store. The woodland habitat is s rich food source for herbivores, insectivores, carnivores, and omnivores. The refresh to this diorama includes cleaning, new water surface, adding steelhead trout and insects. The sometimes vicious world of underwater predators will be a focus. A touchable enlarged larval dragonfly will be added. Chaparral is very adaptable and home to diverse creatures. The refresh to this diorama includes cleaning and repairing existing taxidermy, adding new grasses, replacing plant models, insects and a snake. Salt marshes function as nature’s water filtration system. This refreshed diorama will have new insect models and repaired bird taxidermy. Beaches support a variety of bird species. This refreshed diorama will be thoroughly cleaned, models updated, and have animals added. New stories about ant lions and fuzzy dune beetles will be added. The kelp forest provides shelter and protection for many animals, like a forest on land. This is a new diorama. Our volunteer docents will use this new Santa Barbara Gallery activity cart to interact with school children and visitors. The cart will house rocks, insects, and other natural items. This cart will represent a significant upgrade for our docents and guests and provide a significantly higher interaction for all. Many of the Central Coast’s abundant birds take flight in artist Ray Strong’s beautiful dioramas. This hall will be lit, renovated and modified to better connect to the adjacent Bird Hall. Habitat and how birds rely on the lands we conserve will be a key story along with adaptation and even cranes dancing. Showcasing the unique reasons birds migrate through Santa Barbara via a map showing migration routes and media showing seasonality. Exhibit featuring bird beaks and feet as well as wing models. Eggs and nests displayed with information about how eggs help scientists better understand environmental stories over time. Our volunteer docents will use this new Bird Hall activity cart to interact with school children and visitors. The cart will house nests, beaks, feathers, eggs, and other ornithological related items. This cart will represent a significant upgrade for our docents and guests and provide a significantly higher interaction for all. Ray Strong painted diorama of the mouth of the Goleta Slough. This existing diorama will be cleaned, patched, and some areas repainted. New natural materials will be added. Interpretation and interactive of bird behavior and their adaptations to hunt food beneath the sand will be included. Painted by Ray Strong this existing diorama depicts the freshwater marsh at Laguna Lake, home to Herons and Egrets. It will be cleaned, patched, and some areas repainted. New natural materials will be added and some of the mounts repositioned. Casting of waterfowl beaks, nest with eggs, and fish will be added. Wetlands are supremely important to our migrating and resident birds. We’ll show you why. Ray Strong painted diorama depicting Figueroa Mountain, home to the Golden Eagle. This existing diorama will be cleaned, patched, and some areas repainted. A graphic explaining “Eagle Eyes” and touchable interactives will be added. Ray Strong painted diorama depicting the Carrizo Plain and Soda Lake where Sandhill Cranes can be find on their migration path. This existing diorama will be cleaned, patched, and some areas repainted. Floor decals of crane dancing displays will be added, encouraging visitors to try their moves. Ray Strong painted diorama depicting Mt. Pinos National Forest. This existing diorama will be cleaned, patched, and some areas repainted. We’ll dig deeper into the survival strategies of species, including their remarkable capacity to carry, store, and recall where they stashed their cache. Ray Strong painted diorama depicting San Rafael Wilderness is the backdrop for the California Condor. This existing diorama will be cleaned, patched, and some areas repainted. These aren’t’ just any condors. We know them and they have a story. It’s time we told of our role in saving this species from near certain extinction. Ray Strong painted diorama depicting Mojave Desert, home to the Cactus Wren. This existing diorama will be cleaned, patched, and some areas repainted. A touchable cross-sectional model of a nest in a spiny branch of cactus will be added. Wrens literally use the spines of the cactus to create a fortress, safe from predators. Well show and interpret that. Ray Strong painted diorama depicting Fraser Point on Santa Cruz Island and the seabird colonies found. This existing diorama will be cleaned, patched, and some areas repainted. New natural materials will be added and the damaged Cormorants replaced. Touchable models of eggs showing the effects of DDT will be added. The role of our museum in solving the DDT challenge will be highlighted. The extreme value of collections is a key message here. Welcome area where volunteers and staff first interact with visitors to the Pavilion. Live and prepared specimens and magnified wing photos. This area will be custom designed to create the highest quality visitor experience as guests begin their pavilion experience. A significant upgrade for butterfly and nature interpretation, worthy of this brand new space. Outdoor area beyond The Pavilion used for nature programs, nature play and a top quality place for kids to do what they do best. Explore and play in nature! The artificial creek in the Museum’s Backyard area will be improved with new pumps for better water circulation, as well as the creation of wheelchair accessibility. Tactilely engage in nature at the entrance to the Museum Backyard. Create designs and build structures using natural materials. Area devoted to creatively mixing and shaping concoctions of water, soil, and plant material. Use real tools to find real fossil remains from high quality fossil matrix and make discoveries while learning about our natural history. 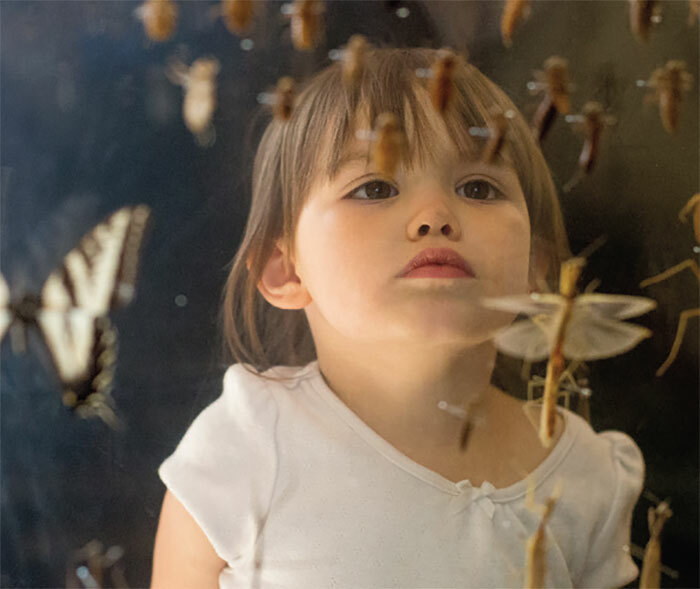 Located in the Museum’s Backyard, the Clubhouse features a naturalist guided interactive experience with insects, amphibians, and more. This will represent a significant update to the look, feel and functionality of this much loved space. High quality animal care and display infrastructure is included. The “back of house” area where animals feed and rest. The rotunda patio area next to the revitalized Palmer Observatory. Often called “the Secret Table”, this beautiful area is found creekside along Butterfly Alley. For those in the know, this is a delightful place to relax and picnic. The new area will be delightful, busy and more than charming than ever. Picnics at the Museum are about to be a big deal. Campaign donors of $250,000 and above to the outside areas will be recognized with their name attractively etched on a boulder. Campaign donors of $100,000 – $250,000 to outside areas will be recognized with a plaque prominently displayed in the area. Campaign donors to interior exhibit areas will be recognized with a personalized plaque and signage in the exhibit area. 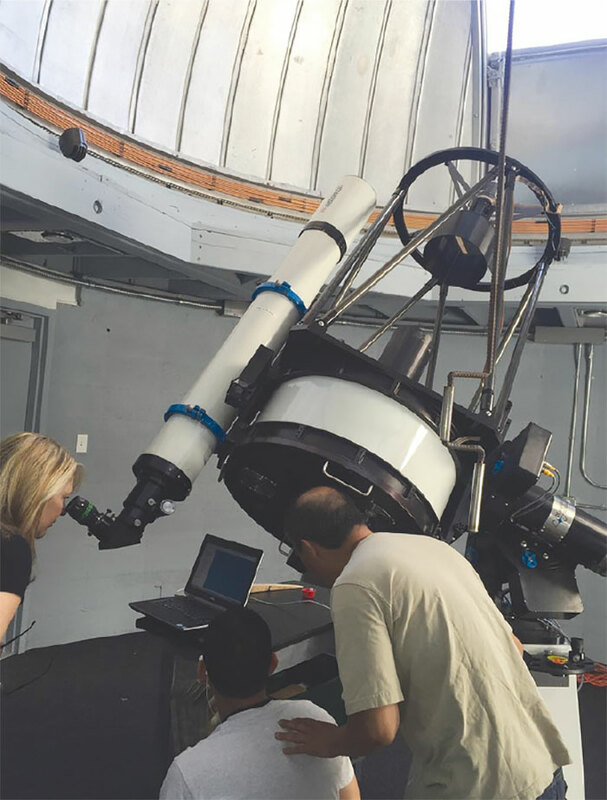 Campaign donors of $25,000 or more to Phase I of the Centennial Campaign will be recognized on a large, beautiful tile plaque displayed in the breezeway near the Mammal Hall and Santa Barbara Gallery.